By consolidating debts such as credit cards with the refinance so the overall monthly payment towards all debt is greatly reduced. 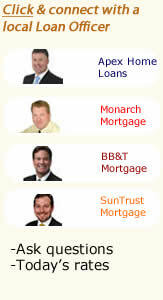 People also refinance to convert their adjustable loan to a fixed loan. One of THE biggest reasons home-owners will refinance in 2007, is because their ARM mortgage is adjusting or getting ready to adjust. This adjustment is taking many loans to the upper 7's and 8 percent range. The main reason behind this type of refinance is to obtain the stability and the security of a fixed loan. Fixed loans are very popular when interest rates are low, whereas adjustable loans tend to be more popular when rates are higher. When rates are low, homeowners refinance to lock in low fixed rates. When rates are high, homeowners prefer adjustable loans to obtain lower payments. Homeowners also refinance to consolidate debts and replace high-interest loans with a low-rate mortgage. The loans being consolidated may include second mortgages, credit lines, student loans, credit cards, etc. In many cases, debt consolidation results in tax savings, since consumers loans are not tax deductible, while a mortgage loan is usually tax deductible. Sometimes, you do not have a choice––you are forced to refinance. This happens when you have a loan with a balloon provision, but with no conversion option. In this case it is best to refinance a few months before the balloon comes due. It may also be that you would like to fix your adjustable rate mortgage, or your ARM is getting ready to adjust to a much higher rate. Also, if your credit scores are high enough we will ignore late mortgage payments if you provide a copy of the separation agreement. Does it matter if I close at the end of the month?